WhoData.org, a community-focused public participation geographic information project, aims to share data that academic, public, private and non-profit organizations can use to assess, monitor and manage quality of life issues. 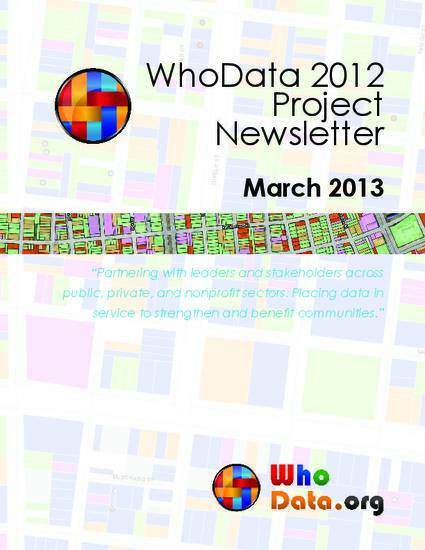 WhoData empowers resident-led, non-profit or communityfocused groups, primarily in New Orleans, with training and resources to map and analyze data they collect on neighborhood conditions and trends. The community data information system, www.whodata.org, houses the results of property condition surveys. Residents are able to highlight priority properties that reflect indicators of blight, create customized maps and export property lists to share with the public and municipal leaders. Neighborhood profile reports, compiled maps and select data analysis are summarized on the project website: www.whodata. net. The WhoData team is primarily supported by dedicated volunteers from the University of New Orleans Department of Planning & Urban Studies, City of New Orleans with support from the GISCorps and the Regional Planning Commission. Operations Management is provided by the Project Director with key support from the Program Operations Manager. Operation Management includes project monitoring, training on data collection methods and techniques, direct supervision of special projects, overall organization, security and control of WhoData resources.